Record label: Jive Records/Zomba Records Holdings B.V.
Sonic Dance Power VIII is the final volume in a series of techno, pop and dance music compilation albums released in Europe. 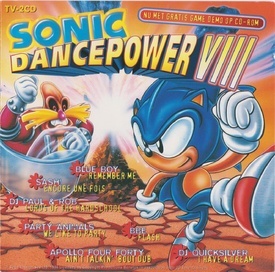 Just as before, the Sonic the Hedgehog license was used in the packaging of the game, but had no relation to the songs within. The final volume also includs a bonus CD-ROM for Windows featuring a playable demo of Sonic & Knuckles Collection.